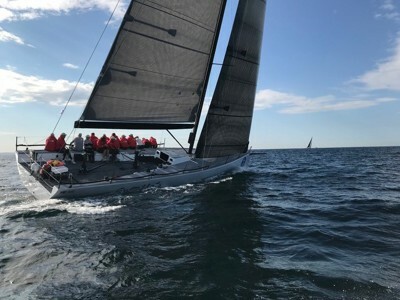 A new entry to the Australian racing arena, with the CYCA Winter Series and the Noakes Sydney Gold Coast (where she finished fifth overall) under her belt. Originally called Container, the 2011 Judel/Vrolijk design is the sistership to the original RAN with some top place finishes at Med Cup regattas. Owners Chris Townsend and Matt Donald have called the boat Gweilo, which is slang Cantonese for white man or ghost man, and they have the ghost livery to match. Skipper Mike Green will lead the highly experienced team of Balance and Quest sailors and he says this TP52 has the pedigree, if they can make it do the numbers.